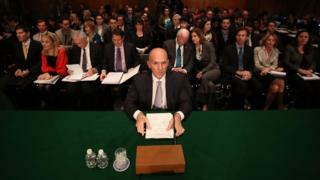 Equifax quarterly profits plunged 27% and revenue growth was lower in the most recent quarter, as the credit bureau grappled with fallout from a major data breach. The company has said personal information of more than 145 million people in the US and the UK may have been exposed. Equifax said the data breach had cost it $87.5m (£66.6m) so far. The head of the firm said it had "an important journey" to regain trust. Customers, which include banks, credit card issuers and public agencies, are postponing business and the incident has spurred government investigations as well as calls for new regulations. The firm said it expected revenue growth in the fourth quarter to be 3% to 4% lower as a result of the incident and cyber-related expenses to exceed $60m. It said the actions it has taken would improve the business in the long-term. "I have high confidence... we will emerge from this an even stronger company," said interim chief executive Paulino Barros, who was installed after the previous boss resigned. Equifax said third-quarter revenues rose 4% to $834.8m (£635.5m), but this was below its previous forecast of 6-7% growth. Profits in the three months to the end of September were $96.3m, down 27% as expenses climbed. Those included legal and consulting fees, as well as costs related to the free services offered to people whose data was compromised.